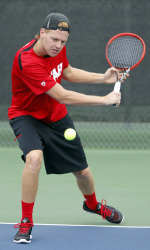 SALT LAKE CITY – The Utah men’s tennis team saw several of its Utes advance to finals action at the Utah Intercollegiate Friday at Coach Mike’s Tennis Academy. Championship rounds are slated for Saturday at 9 a.m. Spectators are welcome and admission to the tournament is free. Second-seeded Willems was able to nab a victory from fellow Ute junior Matt Cowley in the semifinals, 6-2, 7-5 and will face fourth-seeded Shane Monroe of BYU. Cowley will battle BYU’s Francis Sargeant Saturday to determine the third and fourth places. Freshman Santiago Sierra was topped by Utah State’s Jack Swindells in the consolation bracket, 6-1, 6-4. Freshman Louis-Philippe Gascon battled first-seeded Sebastian Schneider of Utah State to a tough three-set loss, 6-1, 3-6, 6-3, but prepares to claim third or fourth place in a match against Aggie Tomas Cosmai Saturday. In the consolation bracket, Swiggart bested Andrew Nakajima of Utah State, 7-6(5), 6-4, before falling to Cougar Jeremy Bourgeois, 4-6, 6-2, 7-5. Freshman Johan Jonhagen defeated David Ball of BYU, 6-2, 5-7, 7-6(4) and then topped fellow Ute junior Justin Archer, 2-6, 6-4, 7-6(3). He will battle Bourgeois Saturday in the consolation finals. Second-seeded Willems and Swiggart downed Cosmai and Nakajima of Utah State in the quarterfinals, 8-5, then followed up with an 8-6 victory over Aggies Schneider and Marcus Fritz in the semifinals. Cowley and Sierra also advanced through the quarterfinal round after upsetting fourth-seeded Swindells and Karan Salwan of Utah State. The duo was unable to continue the winning momentum and fell to BYU’s Sargeant and Ball, 8-6, in the semifinals. Willems and Swiggart will have a chance to avenge their fellow Utes when they take on the Cougar pair Saturday in the finals. Cowley and Sierra will face Schneider and Fritz to determine the third and fourth places.